GoPro's Hero3+ is one of those vexingly-horizontal iterations that make it almost impossible to know whether it's worth upgrading. Still, GoPro is making a number of claims of superiority regarding the 3+'s image quality, audio quality, and battery life. And then there's the new SuperView mode. Plus a new included wireless remote. Existing Hero3 owners can be forgiven if, after hearing all the buzz, they find themselves wondering whether the 3+ is a new camera entirely—one that obsoletes the existing Hero3 Black. Let's jump to image quality right away: the Hero 3+ clearly betters the Hero 3, but only in full-auto mode. Shoot Protune, and both cameras provide video so similar even dedicated pixel-peepers will struggle to differentiate the two. That suggests the 3+'s improvement is primarily via better in-camera processing. But don't discount this improvement: many users never muck around with Protune, nor do they want to. In Auto Mode, the 3+ easily looks sharper, brighter, and more contrasty. So let's call it a win for the 3+. Switch to Protune mode, and the comparison gets murkier. First of all, there's a firmware update for the 3+ which adds several new Protune options unavailable to Hero3 users. It's a useful but imperfect update (exposure compensation but no manual exposure control). Oddly, Protune/Camera Raw color balance now gives your footage an obvious magenta tint which must be fixed via post-processing. GoPro told me this is how the Hero3+ is designed to function, but I'm betting this 'feature' will eventually be changed (ie, fixed). Fixed Protune white balance settings fare better in the 3+, as does "auto" white Balance. In Protune mode I say corner sharpness is very slightly improved in the Hero3+. Color fringing (Chromatic Abberations) may be slightly better as well. Distortion is the same. The 3+ probably has a better lens overall, but it's an improvement that's functionally invisible, especially at 1080P resolutions. Result: Tie. Battery life is better in the 3+. Given that battery life is a major weakness of the Hero3, this looks like a win for the 3+, but effective battery life is only slightly better, some 20-30% better under actual shooting conditions, which means you'll still want to carry extra batteries for anything other than short (let's say 1-2hr) shooting sessions. Winner: neither. Sound quality is improved, but only in-the-case. Why? The Hero3+'s case has been redesigned to make it more compact, and mic placement has been tweaked. 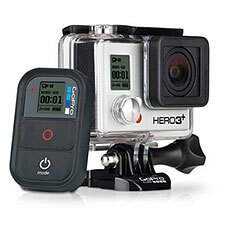 Together, this makes the Hero3+ sound better, in-case, compared to the Hero3, in-case. Outside the case, I find the sound essentially identical to the Hero3 version (I even looked at the waveforms), which makes this a conditional call for the 3+. On the subject of the waterproof case, the new more compact case is a clear win for the 3+ version, though you can buy the same case for your older Hero3, as the actual camera bodies remain the same. Here's something you may like: SuperView mode. Superview gives us an HD picture by taking the data from GoPro's 4:3 sensor and stretching (instead of cropping) it to a 16:9 aspect ratio—just like your HD TV does with old 4:3 standard-def programming. This is not as crazy as it sounds: it's actually quite genius, because it produces a huge image, vastly expanding the camera's field of view. GoPro says this produces a much wider field of view (true!) with much less distortion (not quite so true). In practice, SuperView works well with some scenes, and not so well with others. It definitely adds its own flavor, trading one kind of distortion for another. Some users will love it and some will hate it. Either way, Superview is certainly a valid and welcome creative tool. Zooming out, so to speak, let's remember that the original Hero3 was a stunner of a camera, and remains so today. At some point in my comparison shooting, I found myself realizing that trying to parse the two cameras' image quality is a lot like splitting hairs. The only obvious difference, aside from SuperView, is that damned purple tint in Protune/Camera Raw mode. Both cameras remain somewhat non user-friendly, especially if you don't have the GoPro App on your SmartPhone, and somewhat fiddly when it comes to getting the best possible picture. Getting natural colors has always been a challenge with helmet cameras. It remains so with both Hero 3 versions. Despite Protune tweaks and very high resolution settings, neither camera as yet matches the subjective look and feel of today's DSLR footage. If you're happily shooting Protune footage with your existing Hero3, you may want to sit tight as the 3+ adds little in the way of (visible) picture improvement—though SuperView mode plus exposure compensation are valuable additions. Full-auto shooters will easily notice the Hero3+'s improved in-camera processing, making it a modest but perhaps more compelling upgrade.